Best applied with a 3/4" wide brush. Diamond FX split cakes are easy to apply with a sponge or brush, although the 30 g cakes are better applied with a 3/4" brush for one stroke work. 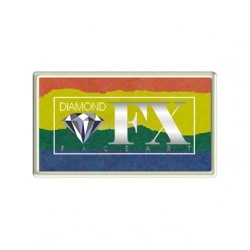 Click here for a Material Safety Data Sheet for Diamond FX Essential and Metallic products.